#WBK10DoT is over: What next? I hope you have enjoyed exploring twitter during the past 10 days and could find valuable information resources and/or start connecting with people of your interest. At this point I thought it would be nice to offer some suggestions about how you can continue to use Twitter in your context. Hashtags are a great way to make your area of interest, and the materials you produce more visible. You should not hold back about creating your own hashtags if no relevant ones exist, but remember what we covered on Day 5. Twitter is a great way to raise awareness of events your Organisation or Department may be hosting. You can then LiveChat the event to further raise awareness or monitor Twitter chat from events you can’t physically attend. Twitter is also a very good medium for helping you to reach out to new audiences. These two forms of social media work very well together. It is a good idea to keep your blogs managed in such a way that the essential content of each blog can easily be tweeted. I’ll shortly be sending round an evaluation survey, to find out what you thought of 10 Days of Twitter. I’d really welcome your feedback, so I can improve the programme and perhaps run future courses like this on other aspects of E-Learning or social media! Now you’ve learned to use Twitter as part of the #HSLU10DoT community, it would be great if we can sustain the conversations and the community around E-Learning and social media at HSLU. The @ZentrumLL account for Zentrum Lernen und Lehren draws together information and conversations around digital learning, teaching and assessment at HSLU. Keep following for information about activities and maybe upcoming courses on digital learning topics within the HSLU and beyond. Do message us to ask questions, engage in conversations or draw our attention to anything you think we should know about! I’ll still be around on Twitter as @cinigabellini of course, tweeting about a wide range of issues to do with E-Learning. I look forward to interacting with you in future – do keep in touch! Twitter is ephemeral. Tweets are short, throwaway observations, which capture the present moment, flow past quickly and are succeeded by more recent and relevant ones. We’ve looked at a way to favourite tweets, and to bookmark the URLs they may contain, but once you’ve done this, why would you want to keep a tweet? Why would you want to tweet in advance, rather than in the moment? Let’s look first at deleting. You can delete your own tweets, by hovering over it and using the option that appears below next to ‘reply’, ‘retweet’, etc. If you make a mistake in a tweet, it might be less confusing to send another tweet with a correction rather than delete one that people may already have seen. If you tweet something you shouldn’t… well, don’t! However, you can’t delete someone else’s tweets, so if they’ve already retweeted you, taken a screenshot, or archived the tweet using some of the options below, it might be too late! Perhaps you want to preserve a selection of good advice or observations on a topic, when you ‘crowdsourced’ – asked for suggestions on Twitter and got some great responses. You might want to keep and share them with others. You can save a link to individual tweets. Each tweet has its own URL. To find this, you click on down arrow at the top right of the tweet. A context menu will open, select copy link to tweet, then paste the link wherever you like. This will open a new tab/window for that single tweet which contains the URL. You can copy and paste this URL, or save it, bookmark it, embed it in a website, or email it to people. This might not be the best or most convenient way to present tweets for others though. However, one of the nicest ways to keep tweets, especially for others, is a third party application called Storify. Storify is the tool which makes a narrative overview of tweets and other social media by linking to content on the web, including tweets, websites and blogs, Facebook posts, YouTube videos, or photos on Flickr. You can search for content, drag and drop it into a linear narrative, add some comments to contextualise it, and publish it on the web or share the URL. You are linking to the original source, rather than taking the content, so it doesn’t breach copyright. It automatically notifies people whose content you have used in this way, so if they object to your use, you can edit out their material (all the material visible to Storify is publically visible anyway). Storify is a really nice way to create and share a summary of tweets and other online material around an event or discussion, such as a conference, blog or livechat. Storify is the tool I used to create a summary of the first week of #WBK10DoT on Day Five. You can schedule tweets to send themselves automatically later on. You can’t do this from Twitter itself, but will need to use one of the additional apps mentioned in Days 8 and 9, so you may wish to leave this topic for later if you want to consolidate the basics first. Although Twitter is a medium which captures the moment, there are several reasons why you might want to schedule tweets for a later time. 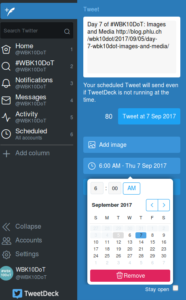 You can schedule tweets from both Tweetdeck and Hootsuite. 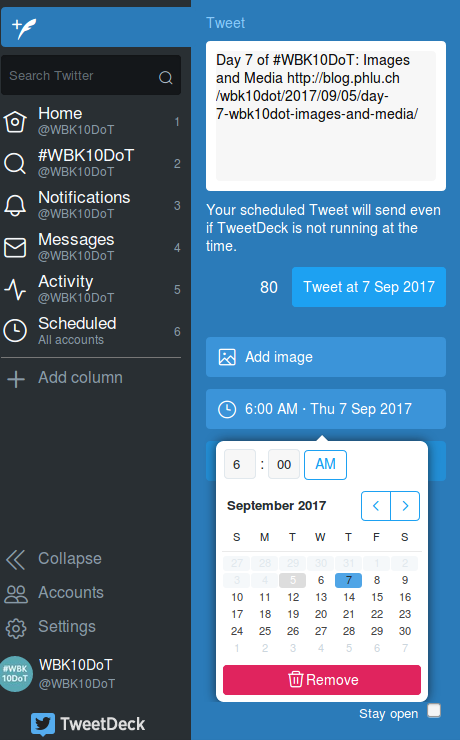 To schedule a tweet in Tweetdeck, for example, write a tweet as normal, and then click on ‘Schedule Tweet’. This brings up a small calendar, where you can choose the time and date when you want your tweet to be sent. There’s quite a bit there to play with! Well, that’s the last of our Ten Days of Twitter, but don’t worry if you’re still catching up – so are others, and the conversation will be continuing on #WBK10DoT for quite some time, I hope! You might like to keep an eye on the programme hashtag and support learning developer colleagues as they learn how to use Twitter. I hope you’ve found the programme useful, and thanks for joining in! Keep tweeting! (If you’ve experimented with Twitter and decided it’s not for you, then I hope we’ve helped you come to a better understanding of what it is, and a well informed decision on whether to use it or not. If you now want to delete your account, it’s easy to do so. We encourage you to keep your digital footprint tidy!). If you’re choosing who to follow effectively, then your Twitter feed should be full of interesting tweets and links to webpages etc. which you might want to follow up on. It’s easy to get overwhelmed, lose track of it all, miss things and mislay things! Twitter itself has a few features which can help you stay on top of all the information. When you want to look at your liked tweets, you will see them marked in your Twitter stream, but it’s easier to see them all together. If you click on the top tab with the profile icon and ‘Me’ you will see your ‘likes’ as well as your tweets, followers and following. Click on ‘Likes’ to view. When you like a tweet, the person who tweeted it is notified, which may help to gain you an extra follower, but it also gives them feedback on what others are finding useful. If you set up a Tweetdeck account yesterday, you can also add a column for your ‘liked’ tweets. You can also search for tweets, by username, hashtag or just by a keyword. The search box is at the top of the screen in the right hand corner. You can also organise the search results by top (most popular) topics, all results, or limit the results just to the people you follow. You can save the search so you don’t need to keep performing it – useful if you’re following a hastagged discussion. At the top of the result page click on the more icon (3 vertical dots) to save the search. When you click the search box, your saved searches will be listed underneath. Whereas traditionally, Tweets appeared in your timeline in reverse chronological order (i.e. with the most recent at the top), Twitter now decides which Tweets you will find most important. Twitter will select ‘Tweets you are likely to care about most will show up first in your timeline. We choose them based on accounts you interact with most, Tweets you engage with, and much more’. If you’re feeling more adventurous again today, here are a few more third party apps which will help you curate all the links which people are tweeting about. If you explored Tweetdeck yesterday, you may not have realised that not only can you add columns for lists of people, you can also add columns to follow hashtags. Click on ‘Add column’, and then choose ‘Search’. If you perform a search for a hashtag, you can add a new column to your Tweetdeck which will now display all the tweets using that hashtag, whether you follow the people using it or not. This might be useful if you are following a conference hashtag or chat such as #LTHEchat but don’t want to follow all of the people tweeting with this hashtag. Pocket is an application which saves any webpape and blog posts for you to look at in more detail later, when you have time, also when you are offline. It is a bookmarking tool – if you find a webpage via a link in Twitter (or anywhere else), you can save it to Pocket, and then return to it and the other things you’ve saved later on. Moreover you can tag your saved content. Pocket is a web browser based service, meaning you can access it from anywhere and any device or computer. To find out more about Pocket, and how to set up an account, see instructions in its ‘help’ section. If you use a smartphone or tablet such as an iPhone, iPad or Android device, you could download an app which curates content from your Twitter feed, such as Flipboard. Once you have downloaded the app, you can connect it with your Twitter account (or other social media) and it will draw in the links that people share with you and display them for you. To find out more about Flipboard, and how to set up an account, see instructions in its ‘support’ section. So there are a range of ways to stay on top of all the information that’s being shared with you by the people you follow. Choose one that looks useful to you, and experiment with it! Tweet to let us know your thoughts and findings! Over the last seven days, you may have found that as you continue to use Twitter, you come across more and more interesting people to follow, and your following also grows exponentially. Keeping track of them all can be a challenge, and sometimes you will want to focus on certain groups of them over others, or check in on some people only sporadically. This is hard to do in the undifferentiated stream of tweets on your Twitter feed, where they are all mixed in together. Fortunately, there are ways to split up your Twitter stream and group the people you follow into separate streams, so you can keep an eye on their tweets as it suits you. Twitter has a feature which allows you to make lists of people – and you need not follow all of them to add them to a list. These lists can be private, so only you can see them, or they might be public so you can share them with others. I created such a list for the participants of this course on Day 2, so you could find each other on Day 3. You might create such a list for the benefit of others, for example, to bring together the attendees at a workshop or conference, students on a particular programme or module, or the top accounts on a particular topic which you recommend other people should follow. You can share a list by giving people the URL of the list page, or let them view the lists you’ve created on your profile, where they can subscribe to your lists too. To create a list on Twitter, click on your small Profile Picture at the top of the screen, and select ‘Lists’, and you will see a page which will contain any lists you will make. Click on ‘Create list’, and you will be asked to name your new list and add a brief description. This description will be very helpful if you now choose to make the list public, so others can find and subscribe to it. You will now be invited to search for people to add to your list. You can also add them later, by clicking on their @name and going to their profile. If you click on the Gear Wheel you will see a menu containing the option ‘add or remove from lists’. To view your lists, or those of other people, you can simply open the profile page (click on the @name or profile picture), on the top bar the number of lists is shown, click that number to open the list page and select the ones you like to view. While we’re on the topic of managing people, you can also block or report people, for example, if you are followed by a spam account or someone you don’t want following you. Blocking accounts on Twitter tells you how you can block or mute activities from unwanted or undesirable accounts. The beauty of Twitter is in its simplicity as a platform. However, sometimes you need a bit more functionality. You might want a more convenient way to view different aspects of your Twitter stream, or even add in updates from other platforms such as Facebook or LinkedIn together with Twitter, so your whole social media stream is visible in one place. To do this, you can use one of the third party applications that were developed to make Twitter easier to use. Tweetdeck is owned by Twitter, and is a good way to manage multiple accounts (for personal and professional use, or perhaps an individual one and an official one on behalf of an institution). However, you can also use Tweetdeck to split your Twitter stream into columns divided by people. It will import any lists you have made on Twitter too. Moreover you can schedule Tweets (that is what I am doing for the daily tasks). You can use tweetdeck.com as a web-based application to access from anywhere, login with your Twitter account. Tweetdeck is organised into a number of columns, such as your timeline, your own tweets or your @mentions (tweets that mention you), and you can add new columns for the lists you have created or for a specific hastag to watch. You can also create new lists in Tweetdeck. Click on ‘add’ icon, and choose ‘lists’ (or any other column you want to add!). You can do everything we’ve covered in Twitter on Tweetdeck too, including shortening URLs. Tweetdeck also makes some other things in Twitter a little bit easier. More about on the help pages. Hootsuite is similar application to Tweetdeck, but it allows you also to import other social media accounts such as Facebook, and it is also available as an app for mobile devices. You can sign up using Facebook, or if you prefer to keep Facebook separate from your professional social media use, you can sign up with an email address, name and password. It will then ask you to add your chosen social network accounts. You can then add streams of content similarly as in Tweetdeck, and tabs for the different social networks. Hootsuite has a quick start guide to help you set up your account. The other bonus of tools like Tweetdeck and Hootsuite is that you don’t see the advertising ‘promoted tweets’ from companies you don’t follow! Think about the kinds of update you’ve seen on Twitter so far from the people you follow. Who do you most want to see tweets from? Create a list of your colleagues on Twitter, or perhaps one for the people you do not want to follow directly, choose private or public. You might want to explore TweetDeck or Hootsuite. Note, these tools are also helpful for managing information. More about this on Day 9. I’m sure that, by now, you will have noticed that your Twitter feed contains a lot more than just text! While Twitter is primarily text based, a picture, as they say, paints a thousand words. Adding an image to text makes it much more effective, and moving images are even more eye-catching. By tweeting pictures you can share the atmosphere at a conference, or a keynote speaker, or a poster that you think your followers will find interesting, or the results of a group activity in a seminar, or the cover of your latest book! Adding media to your tweets is very straightforward but is slightly different depending on whether you are using a PC or an app on a mobile device. There are restrictions, of course – pictures must be in a certain format (i.e. GIF, JPG or PNG) and cannot be bigger than 5Mb, and videos can only be a maximum of 30 seconds long. Simply click on the photo button, browse to your picture, and pick the one you want to share. With the GIF button you can insert an animated gif (provided by the huge giphy web library). The Twitter app is available for both iOS and Android devices and once you’ve installed it simply tap to create a tweet in the usual way. You can choose to select a picture or video from your library, in addition you can choose to take a new picture or record a video from inside the app. However, you need to give the app permission to access your pictures and, if you want to record video, to access your camera and microphone as well. Once you have added your chosen media, add a comment in the ‘What’s happening’ box and tweet. While you might not feel the need to disable video autoplay on a PC, you might have different ideas about mobile devices, where the default setting is to autoplay videos using either Wi-Fi or mobile data, whichever is available. Video content can eat into your mobile data so, if your package only has a limited data allowance, you might want to switch to ‘Use Wi-Fi only’ or even disable autoplay videos completely. You’ve send a few tweets over the last five days – hopefully you’ve found plenty of information which would be of interest to others, whether they are your peers in your field, other professionals within or beyond adult and professional education or to the general public. to you, by displaying to others that you’re well connected to interesting and important people, and that you are a discerning judge of what information is interesting and significant! 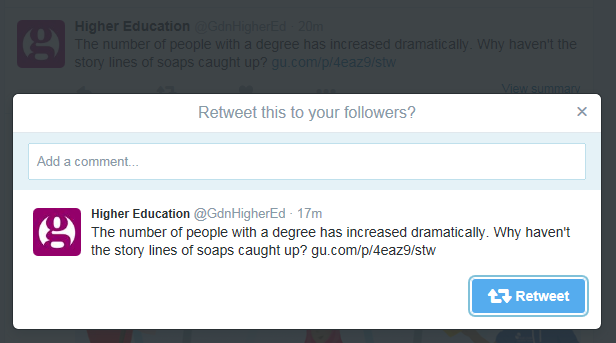 To retweet a message, you simply click on the ‘retweet’ button which appears below each tweet when you hover over it. The message will then appear in your followers’ Twitter streams as if it appeared from the original sender, even though they may not follow them (although they might!). The tweet that they see will be marked with ‘username retweeted’ in small lettering, so if they look, they can tell that it was you who retweeted it. This makes the tweet come from your account, rather than the original sender, making it clear that it’s you who has chosen to pass this information on. Remember that to use Twitter effectively to promote your own work, you need to update frequently with interesting content to gain a following, and you also need to reciprocate and promote the work of others. No one wants to read or retweet a Twitter feed which is just broadcasting announcements about itself! So – have a look at your twitter stream and see if you can find tweets you think your followers might be interested in – funding opportunities, calls for papers, an item of news, an event, a new blog post or publication someone’s tweeted about, a comment you agree with… and start retweeting! Hashtags is where Twitter really gets interesting. Today is therefore a little more complex than usual, apologies! The hashtag is, like the @message, a feature that was developed by early users of Twitter, and was taken up and integrated into the platform as it was so useful. The hashtag for 10 Days of Twitter is, as you’ve guessed, #WBK10DoT. You can therefore search for any tweets containing that hashtag, whether you follow the people using it or not. It’s how I found out who was participating in 10 Days of Twitter on Day 2 when you sent a tweet with the hashtag in, and any tweets you’ve sent since using it. If you’re a Mac user and wondering where your hashtag key is, you need to press the alt key and the 3 key together to make the # symbol! A hashtag needs to be a single word, preceded by a # symbol, with no spaces or other characters. It doesn’t need to be a real word – it can be an acronym of some sort, like #WBK10DoT, and it needs to be understood, known or guessed by the people it’s relevant to. It could even be several words run into one (which counts as one word!) such as #ILoveTwitter (it can help to capitalise the individual words to make it easier to read). What it should be above anything else, though, is short, so that it doesn’t use up too many characters! How do you know what hashtags to use, or to search for? You make them up! If you’re creating a new hashtag, it’s good to do a search first and check if it’s been used before, and if it has been used before, whether you are going to use it in a similar way for similar people. If so, you’re joining a larger, pre-existing conversation! If not, then you might be confusing things, with a hashtag meaning different things to different people. If you’re talking to a limited, known group, as I am here, or as you might at a conference, then the hashtag might be meaningless to outsiders (which is probably fine – people for whom it’s relevant will probably be aware of it already or easily figure it out). If you’re creating a hashtag hoping to start a larger discussion which is open to anyone, then it needs to be self-explanatory and something that someone might very likely search for or guess, like #adulteducation. You’ll see people using hashtags you might be interested in when scanning your Twitter feed, and if you click on the hashtag, you will find all the other tweets using that hashtag recently. Hashtags really come in useful in different ways. Someone might start a discussion about a topic on Twitter which is open to all to contribute, and it is drawn together using a common hashtag. You can also use it to gather responses. For example #oer is a useful way for learning developers to share resources, guidelines and thinking on Open Educational Resources, and give the public an insight on this topic. You might also be interested in other hashtags for education. A live chat is a conversation on Twitter which takes place in real time. A topic, time and a hashtag is agreed by the leaders, and they are joined on the day by people who want to talk about that topic with each other. Livechats can be fast and furious, but a great way to discuss, make new contacts and share experiences. Popular ones which you might be interested in are #LTHEchat, a weekly chat for educators in higher education to discuss learning and teaching and #EdchatDE, the german twitter chat for educators and others. Search for the hashtags to see what was discussed last time, and join in the next one! To livetweet an event means to tweet about it while you’re actually participating in it. Conferences or seminar presentations are often livetweeted. This may be done in an official capacity, with organisers inviting participants to livetweet the papers, giving attendees a pre-agreed ‘official’ hashtag to use, running up to the event, during and after, to find out who’s going to be there, what the papers were about, and any follow-up questions. A good example of this is the #WBK17 for the Weiterbildungskongress A&PE 2017. When you hear the phrase ‘trending on Twitter’, it means that there are a lot of people talking about the same thing, using a common hashtag. Trending hashtags are also displayed on the left-hand side of your profile page. Hey @cinigabellini, enjoyed your presentation! Do you know @usablelearning’s work on this subject? Note – as the @ sign is reserved for marking people’s handles, you can’t use it as an abbreviation for ‘at’, for example, ‘let’s meet @6pm @cafe’ – it will treat these as an @message, and it’s likely that someone, somewhere, will have chosen @6pm or @cafe as a handle! To see @messages directed at you, click on the tab marked Notifications with the bell icon, at the top of the screen. They will also appear in your Twitter stream, but you may miss them there! Depending on your settings, you can also receive an email when someone @messages you. To set your account to email you when someone mentions you, click on Settings (accessed via your Profile Picture at the top) and then ‘Email Notifications’ in the left hand menu. You may wish to edit the Email Notifications anyway as the default settings may include things you don’t want or need. If you really want to send a message to just one person, but don’t want it publicly visible to anyone else, Twitter allows you to send them a DM or Direct Message, but only if that person follows you. Direct Messages on Twitter operate in the same way as other direct messaging systems, such as Facebook Messenger, for instance. If you want to practice sending a Direct Message, feel free to contact me! If I’ve accidentally omitted to follow you, let me know! So – send some @messages to people you follow – ask them a question, draw their attention to something, comment on something they’ve tweeted! Reply to anyone who messages you, to be polite, if they appear genuine and professional. And remember to send me (@cinigabellini) an @message to tell me how it’s going. Remember to add the hastag #WBK10DoT to your tweet messages. You’ve sent your first tweets, creating interesting and engaging content for your potential followers. The other side to Twitter, of course, is the stream of information brought to you by the people you follow. And if you follow people, chances are they will take a look at your profile and decide to follow you in return (which is why setting up a profile with some engaging tweets first was important!). One of the key features of Twitter is that unlike other platforms, such as Facebook or LinkedIn, following is not necessarily reciprocal – the people you follow may not be the people who follow you (although they might be!). There is no obligation to follow someone just because they follow you. Some people have a more-or-less even match of followers and following; others follow lots of people but don’t tweet much themselves and therefore don’t have many followers; and some tweeters, usually very well-known people or institutions, may have a large number of followers as they tweet a lot but don’t actually follow as many people, using Twitter more as a broadcast medium to get their message out there. As an individual professional, you’re probably going to get the most benefit in the first instance for the first option, having roughly the same number of followers and following. Twitter works best as a dialogue, and this won’t happen if you’re doing all the talking, or have no one to talk to! When you first sign up to Twitter, it will suggest people for you to follow, or invite you to search for names or keywords, but this can be a bit hit and miss. Some people give up at this point, thinking that it’s all pop stars and people tweeting about their breakfast! At this point, it might be useful to know who else is participating in the #WBK10DoT programme, so I’ve compiled a list of everyone who sent the tweet I suggested yesterday, so you can find and follow each other! ‘Celebrity’ academics and media dons Following well-known people and commentators in academia will give you some ideas of how to build your profile and impact, as well as offering commentary on education policy, news on developments in Adult and Professional Education, access to their own network of followers and interesting material to retweet to your followers. 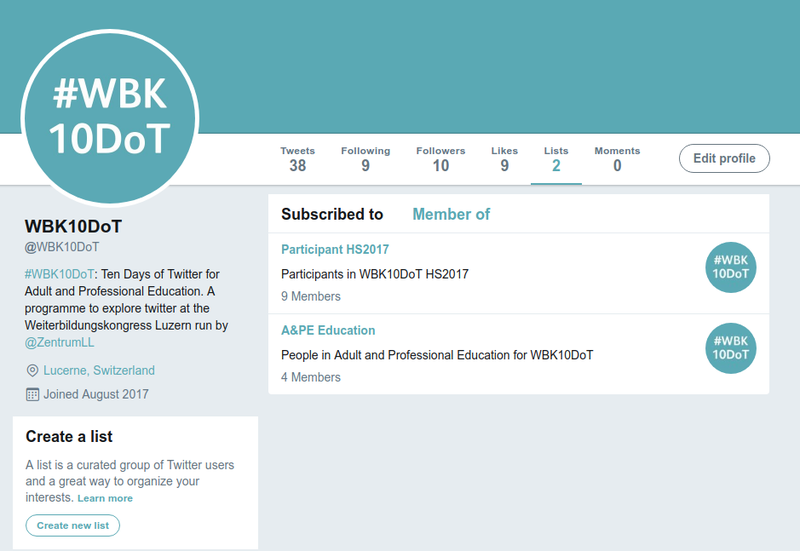 You could follow adult education researchers Michael Kerres orMathias Rohs who tweet about digital education, Jürg Arpagaus, Prorektor Weiterbildung PHLU or Jane Hart, learning advisor in the field of workplace learning. Professional Bodies For updates about events, news, policy, or funding opportunities, your professional body will be very useful. Try for example the Swiss Federation for Adult Learning @SVEB SFEA, Deutsches Institut für Erwachsenenbildung @DIE_Bonn or the Swiss Federal Institute for Vocational Education and Training @EHB_IFFP_IUFFP. Following individual journalists too might be a way to hear about interesting stories or even raise your own profile in the press. Many journals also have their own Twitter accounts which they may use to interact with potential contributors or interviewees. Following colleagues in your discipline is a fantastic way to network. Search for people you know or have heard of to see if they have a Twitter account. Search by name or by keyword, also following the ‘backchannel’ of tweets around large annual conferences is a good way to find out who’s on twitter. Policy makers If you’re interested in government education policy, you could always follow individual politicians or the SBFI. Twitter is partly about the information you tweet, but also about the information you gain from the people you follow. Spend some time reading your twitter feed to see what comes up! This section is a resource that you may want to return to later in the course. If you are new to twitter you may skip this section for the moment. How many people you follow is up to you, although perhaps 100 is a good number to aim for (not all today! ), to ensure a useful stream of content. Think about what sort of information you want access to, and what sorts of tweeters are likely to offer it (see the list below for some suggestions). It is an organic process and will take time to build up, and don’t forget that you can always unfollow people if the content they tweet is not useful to you! The ‘follow’ button will simply turn to ‘unfollow’, giving you this option. There are ways to find out if you’ve been unfollowed, but generally people don’t bother to check! Alternatively, you could mute certain people (some people post huge numbers of tweets which can swamp your feed) and occasionally visit their profile to catch up on their tweets. In some cases this is preferable to completely unfollowing them. More about this next week. How to grow your Twitter feed from here. Snowball – look at the profile of the people you’re following – who do they follow, and who else is following them? You can see who’s following you, or anyone else, by going to your or their profile, and clicking on ‘followers’. Retweets – people you follow will retweet things they think might be of interest to others. Keep an eye out for interesting retweets from accounts you don’t yet follow, and add them. We’ll cover retweeting in future Days. #FF or #FollowFriday – this a convention on Twitter that on Fridays where you tweet the names of people you think are worth following. Watch out for these, or tweet your followers and ask them for recommendations! Follows – you will be notified when new people follow you – look at their profile to see if they are someone you want to follow back. If you suspect one of your new followers is spam, you can ‘block’ them using the gear icon next to the ‘Follow’ button, and selecting ‘block’. It’s as well to do this, especially as people may be looking through your followers for ideas of who to follow, and it doesn’t look good if lots of your followers are spam! So – go find some people to follow, and in spare moments through the day, watch the feed of tweets and information they’re sending. If you find any other interesting people you think others should follow, let us know! Remember to keep an eye out for tweets from @WBK10DoT! Ready to tweet? Twitter only allows you to send 140 characters, which doesn’t seem much. Many people who are new to Twitter aren’t sure what to say, or why updates about whatever they’re doing would be interesting to others. But there are actually many aspects of your day-to-day work that would be of very practical use to others. Have a look at some Twitter feeds from learning developers and institutions in adult education and see what kinds of information they share, to get an idea of how you really can say something useful and engaging in 140 characters. The appropriate tone for a professional Twitter account doesn’t need to be overly formal – you can be chatty and conversational, and allow your personality to come through. In fact, you’ll have to be a bit informal if you want to fit everything in, using abbreviations and even textspeak! Even if tweeting on behalf of a department or group, you need to be engaging rather than formal. Do remember though, if you’re tweeting in any professional capacity, that Twitter is a very public medium, and that your tweets can be kept by others, even if you delete them (more about this on Day 10). Don’t say anything you wouldn’t normally say openly in a work context. Sending a tweet is really easy – when you’re logged into Twitter, you’ll see a box in the middle of the screen at the top, which says „What’s happening?“ If you click in the box, you’ll be able to write your tweet and then click the „Tweet“ button. You can also use the „Tweet“ button in the top right of the screen to compose your tweet (will be opened in a own window). Remember – you’re only able to write 140 characters including spaces. A small counter below this box tells you how many characters you have left. You’ll soon develop a suitably concise style, and learn the tricks to abbreviate your writing, such as using ‘&’ instead of ‘and’. This all adds to the informal tone. Joining in #WBK10DoT with @WBK10DoT! If you already have an twitter account it is a good practice to let your followers know that you take part in a open course, so this first tweet can serve as an announcement. However, you may want to compose the tweet differently for your followers, please feel free to do so, make sure to include the hashtag #WBK10DoT. Skip this task if already done on day 1 or earlier. Over the next week, we’ll be sending various types of tweets. For today, though, just send a few simple messages over the course of the day, using the examples above. Whenever include the hashtag #WBK10DoT in your tweets , we’ll explain why later! Send a few tweets, now and perhaps throughout the day, following suggestions from the list above! Make sure that when people check out your profile created on day 1, there’s some interesting and engaging content there! And remember to add the hashtag #WBK10DoT. Looking forward to read your tweets.